Very nice B & B. We were there one night and for breakfast the next morning. Location, hospitality and breakfast were very good. I first stayed here when I was 18 with a school group. Loved the house and Mary definitely made a mark. I have now been back to Ireland 2 other times and each time, I make a point of staying here. Last time I took my parents. I will be heading back in March of 2016 and already made plans to stay at this amazing place! Can't wait to see Mary! It's become tradition! We had a wonderful stay at the Gallows View B&B. After spending an evening at the Bunratty Banquet it was a quick drive from the Castle to the B&B. Our host was very friendly and accommodating and the breakfast was delicious. It was nice to have a selection of breakfast choices. Great Stay! Charming hosts, website had overcharged me so asked if it was OK if she charged me less! Would be a great value even at the original price. If you're coming up from Bunratty Castle, it's farther down the road than you might think. Gallows View B & B is excellent! We recently stayed in Gallows View for the 2015 Shannon Air Display - our stay was excellent - lovely room: which contained everything we could possibly need and was so comfortable. Delicious, relaxing breakfast and Mary is so welcoming, courteous and friendly..... We highly recommend Gallows View! Beautiful house, room, amenities and hostess who pays attention to detail. Breakfast was early to accommodate our flight and was smoked salmon and eggs. Lovely home I would highly recommend!! Mary McKenna runs a very clean B&B with bright, spacious rooms and hardwood floors. The house is on a narrow road a mile fdown from Bunratty Castle and Durty Nellies Pub. A number of other B&Bs are located on the same road, but we were very happy with our choice. There was plenty of space for parking. The breakfast was ample and served hot even had the option of pancakes or French toast, in addition to eggs, etc, which was nice for vegetarians. Our bathrooms we reserved two rooms had showers with good water pressure, toiletries provided, and were big enough for two people to move around in comfortably. There were also coffee/tea and sweets in each room. If you have a problem with dogs, there are a couple on the property and they bark quite a bit, but they were never allowed near the guests. Mary has been in the hospitality business for many years and is a conscientious business owner with much pride of ownership. She made our stay quite comfortable. Beautiful places nd great food. We really enjoyed our stay here. The property was beautiful and well kept and the service was friendly. The best french toast that we've ever had. Really good location as well. I picked this B&B for it's name alone. I love to read mysteries. It had good reviews and it was close to Shannon Airport. But all my expectation were surpassed. Mary was a delightful hostess and told us about the name. I actually had the front room which had a private balcony and spectacular sunset later on not a view of Gallows Hill. However, we happened to be there on one of the warmest days Ireland had had, and the room was actually too warm until later in the evening. But it was delightful to be able to sleep with the balcony door open. We went with an easy breakfast as we had to an early time to return the car rental. Mary gave us very good directions to get to the airport. Gallows view is a wonderful B&B with lots of feel at home comfort. The price was very reasonable and the Hostess was extreamly friendly and accommidating. She made us an early breakfast so we could catch out flight and was a deligh to talk to. The Gallows View B&B was the perfect place for our first night in Ireland! It is a short drive from the Shannon airport but feels like you're out in the country! Mary, our hostess & innkeeper, welcomed us with tea and a basket of fresh breads. She recommended a lovely restaurant for dinner, JP Clarks. Our room was beautiful and our breakfast was marvelous. The inn is very close to Bunratty Castle, Durty Nellies Pub, and some great shops. A great way to start our trip. Mary was a fine hostess. She accommodated our daughters' need for a gluten free breakfast and recommended a terrific restaurant for dinner. The location is very convenient to the airport, but also quiet. Great hospitality, excellent food, terrific location and lovely rooms. Welcoming and comfortable! Nice place to stay before catching our flight out of Shannon. We had to leave at 5am and the owner offered to get up and cook us a hot breakfast. We wouldn't let her do that so she left us a nice breakfast in the dining room, complete with hot coffee. Very comfy beds and fluffy towels!!! Stayed here for one night last week. What a lovely lovely hospitable and welcoming B & B. We arrived late from airport 10 mins in our hire car and they were all ready for us, with buttered scones and a flask of tea. Nice rooms and a delicious breakfast. This is real Irish hospitality and I would recommend this B & B to anyone and we would definitely visit Mary & John again if we fly into Shannon. Also very close to Durty Nellie's Pub and Bunratty Castle and Theme Park. An excellent B&B. 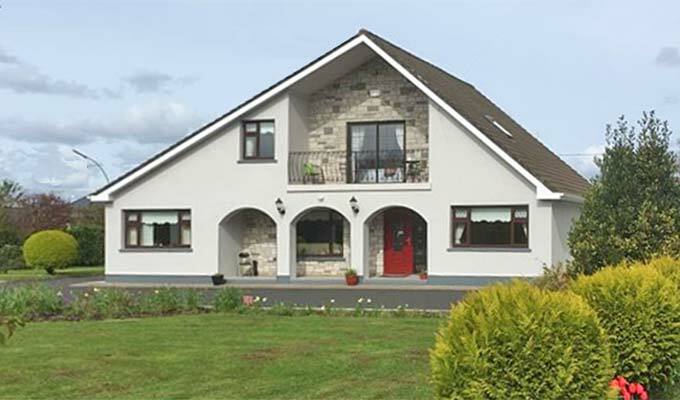 Very convenient for Shannon Airport yet close to all the pubs, restaurants and atmosphere of the Bunratty area. At the B&B Mary is very friendly, informative and a considerate hostess. Our room was very comfortable with everything you could need hair dryer, a large selection of toiletries, tea & coffee making facilities, a comfortable bed and a clean and bright bathroom. Breakfast is delicious and tailored to your requirements. We stayed 4 nights very peaceful & enjoyable. Very comfortable, clean,peaceful, welcoming place! Yet a 2 min drive to the castle and pubs! Mary does a great job hosting you. Very close to Shannon. Ask Mary about the back road to Shannon and you'll be there in 10-15 mins! Always love to stay here when in the Shannon area. Gallows View is a very clean and neat B&B Mary, our host, is extremely friendly and helpful We had an early flight on the morning of our departure and Mary had breakfast ready at about 6:00 am The Gallows View is conveniently located about 10 minutes from Shannon Airport I highly recommend the Gallows View!